There's nothing better than playing with some Jell-O by watching it wiggle around for a while, and then later eating it. It's also one of the things I stock up on, aside from ice cream and sushi, I don't know why. Moving on through the foot steps of their previous hit Wing-Up Knight, Robot Invaders turn the Jell-O against us in a game that combines Tower Defence, Tetris, and Bejeweled in 3D! 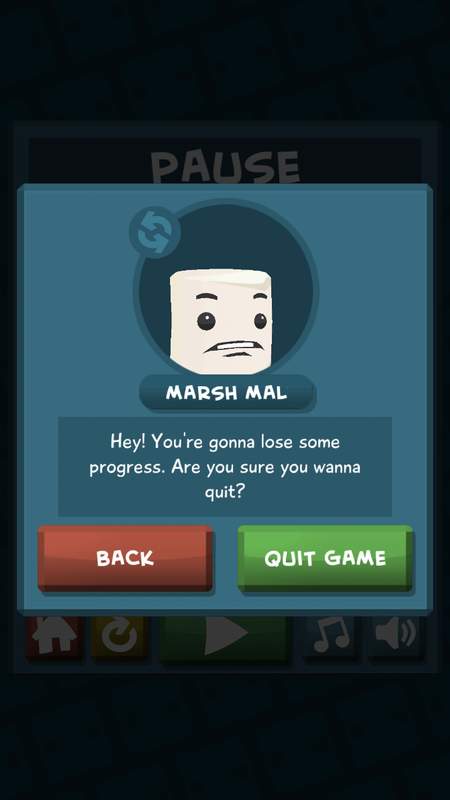 The player takes control of a adorable marshmallow named Mal, guiding him in his quest to escape an never ending swarm of cubed gelatin as it advances up the overtake the hill on which Mal sits, or stands...I cant tell. Your goal is to guide Mal's fruits onto the corresponding colour of Jell-O and blow them up in a Tower Defence, Tetris, and Bejeweled -esque game mode. Instead of trying to fit formation of squares into some other squares, or matching coloured jewels, the player has to send fruit hurling down into the awaiting jiggly cubes. Stuffing the cube with the appropriate fruit prepares it, and surrounding cubes/fruits of the same colour, for eligible destruction. This is where the Tower defense aspect comes in. 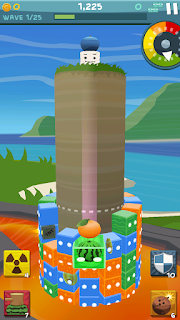 Mal's only goal is to survive the hoards of jiggly cubes - all done by rotating the column Mal stands on by swiping left or right and swiping downwards to increase the speed of the falling fruit. 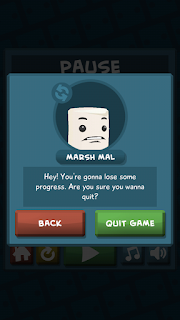 The game offers a few game modes, starting with a survival mode, and later unlocking modes such a timed mode and skull mode. What is similar about all the game modes is that they all share the same three actions, swiping across to rotate the column, swiping down to drop them, and tapping the gelatin to explode it. There are also 4 power ups that can be used by taping on them to help Mal quickly destroy the cubes when in a panic and others that are activated by blowing up the gelatin that contain them. The games design is also well done, and the physics are outstanding, able to register last microsecond turn of the column, or at least when your phone isn't lagging. We found that the physics engine as well as having to render 360 degrees worth of jiggly gelatin really takes a toll on your phone. We had problems getting it to run at all on a Samsung Galaxy ACE II X and a Sony Ericsson Xperia Mini, and the only way to get the best performance was to use a North American SIII on non power saving mode plugged in. It ran perfectly fine on a Note II on power saving mode though. There is one little quirk I have with the code that generates which fruit you get though, it seems that Mal likes to give you the fruit you need the least. I was playing and I noticed that I would get three or four fruits in a row that I couldn't. One time when it really annoyed me would be when I used the coconut bomb to remove all the green Jell-O cubes, and Mal decided to give me five watermelons in a row, thanks... Tim promptly decided to throw his SIII as hard as he could onto the ground after a few rounds of getting multiple fruits he needed the least in a row. Don't worry, it was in an Otterbox! 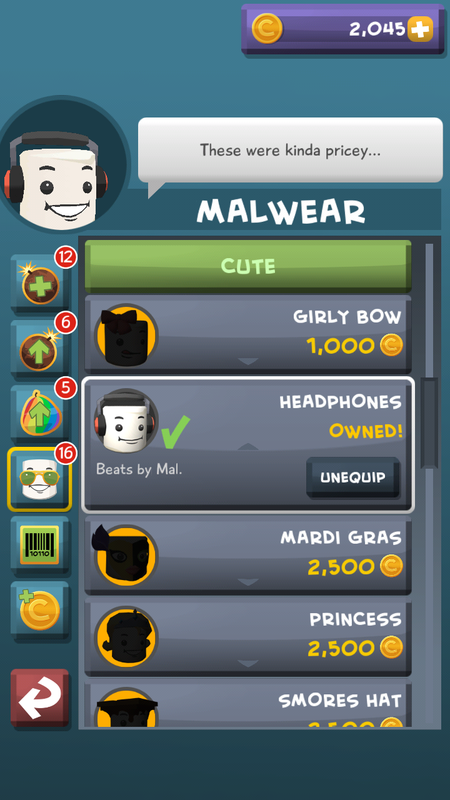 Extra power ups and bonus items can be purchased in the store with coins earned from playing, or simply exchanging your hard earned cash for virtual cash. I found that the coins were a little sparser than what I would like them to be. Mal can also be out fitted with Malware, hahaha get it? Mal can be "pimped out" in the store with "Beats by Mal" and other accessories. It seems that this game is oriented towards teens. This game is amazingly fun and extremely addicting! Highly recommended for anyone! Pick up the app on the Google Play Store Here! Post YOUR highscore below!